Louis Cameron Gossett Jr. (born May 27, 1936) is an American actor. He is best known for his Academy Award winning role as Gunnery Sergeant Emil Foley in the 1982 film An Officer and a Gentleman, and his role as Fiddler in the 1977 ABC television miniseries Roots. Gossett has also starred in numerous other film productions including A Raisin in the Sun, The Landlord, Skin Game, Travels with My Aunt, The Laughing Policeman, The Deep, Jaws 3-D, Wolfgang Petersen's Enemy Mine, the Iron Eagle series, Toy Soldiers and The Punisher, in an acting career that spans over five decades. Gossett was born in Sheepshead Bay, Brooklyn, New York, on May 27, 1936, to Hellen Rebecca (née Wray), a nurse, and Louis Gossett Sr., a porter. He is an alumnus of Mark Twain Intermediate School 239 and Abraham Lincoln High School. His stage debut came at the age of 17, in a school production of You Can't Take It with You when a sports injury resulted in the decision to take an acting class. Polio had already delayed his graduation. After graduating from Abraham Lincoln High School in 1954, he attended New York University, declining an athletic scholarship. Standing 6'4" (1.93 m), he was offered the opportunity to play varsity basketball during his college years at NYU, which he declined to concentrate on theater. His high school teacher had encouraged him to audition for a Broadway part, which resulted in his selection for a starring role on Broadway in 1953 from among 200 other actors well before he entered NYU. Gossett replaced Bill Gunn as Spencer Scott in Broadway's Take a Giant Step, which was selected by The New York Times drama critics as one of the 10 best shows of the year. He was 17, and still a student at Abraham Lincoln High School, with no formal drama training. Gossett's Broadway theatre credits include A Raisin in the Sun (1959). Gossett stepped into the world of cinema in the Sidney Poitier vehicle A Raisin in the Sun in 1961. Also in 1961, Gossett appeared in the original cast of Jean Genet's The Blacks, the longest running off-Broadway play of the decade, running for 1,408 performances. The original cast also featured James Earl Jones, Roscoe Lee Browne, Cicely Tyson, Godfrey Cambridge, Maya Angelou and Charles Gordone. In 1965, Gossett appeared in the musical play, Zulu and the Zayda on Broadway as Paulus with music and lyrics by Harold Rome. Gossett wrote the antiwar folk song "Handsome Johnny" with Richie Havens which Havens recorded in 1966. His Emmy Award-winning role of Fiddler in the 1977 television miniseries Roots first brought Gossett to the audience's attention. In 1983, he was cast in the title role in Sadat, a miniseries which chronicled the life and assassination of Anwar Sadat. While filming An Officer and a Gentleman, Gossett was also starring in the 1982–1983 science fiction series, The Powers of Matthew Star. His role as drill instructor Gunnery Sergeant Emil Foley in the 1982 film An Officer and a Gentleman won him an Academy Award for Best Supporting Actor. He was the first African-American male to win an Oscar in a supporting role, the second black male to win for acting, and the third African-American actor to win overall. In 1986, Gossett starred in another role as a military man (Colonel Chappy Sinclair) in the film Iron Eagle. It was followed by three sequels. Gossett is the voice of the Vortigaunts in the video game Half-Life 2 and is the Free Jaffa Leader Gerak in Season 9 of the sci-fi television series Stargate SG-1. He provides the voice of Lucius Fox in The Batman animated series. He recorded several commercials for a Nashville-based diabetic company, AmMed Direct, LLC. In 1997, Gossett presented When Animals Attack! 4, a one-hour special on Fox. He played the role of fictional U.S. President Gerald Fitzhugh in the 2005 film Left Behind: World at War. In 2008 he filmed the "Keep It Real" series of commercials for the Namibian lager Windhoek. In 2009, Gossett also lent his voice talents in the Thomas Nelson audio Bible production known as The Word of Promise. In this dramatized audio, Gossett played the character of John the Apostle. The project also featured a large ensemble of well known Hollywood actors including Jim Caviezel, John Rhys-Davies, Jon Voight, Gary Sinise, Jason Alexander, Christopher McDonald, Marisa Tomei and John Schneider. In 2013, Gossett starred in the controversial drama, Boiling Pot, which is based on true events of racism that occurred on college campuses across the US during the 2008 Presidential election. The film, written and directed by the Ashmawey brothers under AshmaweyFilms, also stars Danielle Fishel, Keith David, M. Emmet Walsh, and John Heard. Gossett plays a detective attempting to decipher a murder case that was fueled by racism, all while putting aside his own prejudices. Boiling Pot was released in 2014. Gossett returned to television in the CBS All Access series, The Good Fight, guest starring as founding partner Carl Reddick of Diane Lockhart's new firm. He narrated an audiobook based on Twelve Years a Slave. Gossett has been married three times and fathered one son and adopted one son. His first marriage was to Hattie Glascoe; it was annulled. His second, to Christina Mangosing, took place on August 21, 1973. Their son Satie was born in 1974. Gossett and Mangosing divorced in 1975. His third marriage, to Star Search champion Cyndi James-Reese, took place on December 25, 1987. They adopted a son, Sharron (born 1977). Gossett and James-Reese divorced in 1992. Louis is the uncle of actor Robert Gossett who starred on TNT's The Closer. According to DNA analysis, he is descended, chiefly, from people of Liberia and Sierra Leone. On February 9, 2010, Gossett announced that he was suffering from prostate cancer. He added the disease was caught in its early stages, and he expected to make a full recovery. On July 18, 2016, Gossett cohosted as a guest programmer on Turner Classic Movies' primetime lineup. Allowed to choose four movies to air, he selected Blackboard Jungle, Lifeboat, Touch of Evil and The Night of the Hunter. 1958 The Big Story Jamie Goodwin Episode: "The Stubbornest Man"
1962 The Nurses William Taylor Episode: "The Prisoner"
Hemera Episode: "Fang and Claw"
1968 The Invaders Ollie Episode: "The Vise"
1968 Daktari Mkono Episode: "Adam and Jenny"
1968 The Mod Squad Sgt William Smith (Smithy) Episode: "When Smitty Comes Marching Home"
1970 The Bill Cosby Show Hurricane Smith Episode: "The Return of Big Bad Bubba Bronson"
1971 The Partridge Family Sam Episode: "Soul Club"
1971 Bonanza Buck Walter Episode: "The Desperado"
1971 Longstreet Sergeant Cory Episode: "The Way of the Intercepting Fist"
1971 The Bold Ones: The New Doctors Dr. Karnes Episode: "One Lonely Step"
1971 Alias Smith and Jones Joe Sims Episode: "The Bounty Hunter"
1971 Cade's County Episode: "The Alien Land"
1972 Insight Episode: "The Man from Inner Space"
1972 The Rookies Toby Jones Episode: "Covenant with Death"
1972 Love, American Style Freddy Segment: "Love and the Christmas Punch..."
Charley Jameson Episode: "When Smitty Comes Marching Home"
Episode: "Can You Hear Me Out There?" 1973 Owen Marshall: Counselor at Law Episode: "An Often and Familiar Ghost"
1974–75 Petrocelli D.A. Kurt Olson Episode: "A Very Lonely Lady" and "A Fallen Idol"
Uncle Wilbert Episode: "Thelma's Young Man"
1975 Lucas Tanner Bobby Koball Episode: "Bonus Baby"
1975 Caribe David Wallace Episode: "The Assassin"
1975 Harry O Cleon Jackson Episode: "Shades"
1975 The Jeffersons Wendell Brown Episode: "George's Best Friend"
1975 The Six Million Dollar Man O'Flaherty Episode: "Clark Templeton O'Flaherty"
Virgil Barnes Episode: "The Cut Man Caper"
Episode: "50 Cents-First Half Hour, $1.75 All Day"
1976 Little House on the Prairie Henry Hill Episode: "The Long Road Home"
1977 Visions Rex Episode: "Freeman"
1982 American Playhouse Episode: "Zora Is My Name!" 1982 Saturday Night Live Host Episode: "Louis Gossett Jr/George Thorogood & the Destroyers"
1994 Picket Fences Rick Jennings Episode: "Terms of Estrangement"
1997 Touched by an Angel Anderson Walker Episode: "Amazing Grace"
1997 Early Edition Jim Matthews Episode: "The Medal"
1997 Ellen Sgt. Timko Episode: "G.I. Ellen"
2002 Resurrection Blvd. Ezekiel 'Zeke' Grant Episode: "En Un Momento" and "Esperando Lagrimas"
2003 The Dead Zone Pastor David Lewis Episode: "Zion"
2004 Half & Half Ray Willis Episode: "The Big Lover, My Brother Episode" and "The Big Thanks for Nothing Episode"
2009 ER Leo Malcolm Episode: "The Family Man"
2012 Psych Lloyd Episode: "Heeeeere's Lassie"
2013 Boardwalk Empire Oscar Boneau Episode: "Havre de Grace"
2014 Madam Secretary Father Laurent Vasseur Episode: "The Call"
2015 The Spoils Before Dying Duke Webster Episode: "The Trip Trap"
2017 The Good Fight Carl Reddick Episode: "Reddick v Boseman"
1964: Supporting role in the Broadway musical adaptation of Odets' Golden Boy. 2006: Dvorak's New World: Chamber Music Plus. Louis Gossett Jr., narrator, with Aubrey Allicock (Baritone), Sanda Schuldmann (piano), and Harry Clark (writer). ^ Collins, Glenn (February 19, 1989). "Lou Gossett Jr. Battles the Hollywood Stereotype". The New York Times. Retrieved October 28, 2010. ^ Pfefferman, Naomi. "Louis Gossett Jr. to Give Shul Inaugural Ball Toast", The Jewish Journal of Greater Los Angeles, January 15, 2009. Accessed September 23, 2009. "Gossett suspects that his English teacher at Abraham Lincoln High School, Gustave Blum, identified with African Americans because he had experienced anti-Semitism as a result of the blacklists." ^ "Take A Giant Step". Jan Hus Playhouse. Lortel Archives. Archived from the original on 7 October 2012. Retrieved 27 October 2012. ^ "Louis Gossett Jr". The History Makers. 30 March 2005. Retrieved 26 November 2018. ^ "The Word of Promise: Cast". Word of Promise. Thomas Nelson Publishing. Archived from the original on 29 October 2014. Retrieved 26 November 2018. ^ Groves, Martha (16 November 2009). "BELIEFS : Stars lined up for elaborate audio Bible : Michael York, Jason Alexander and many others gave voice to a 79-CD reading of Old and New Testaments". LA Times. Archived from the original on 14 February 2017. Retrieved 26 November 2018. ^ Ng, Philiana (9 February 2017). "Exclusive: 'The Good Fight' Creators Reveal Three New Guest Stars". ET Online. CBS Television Distribution. CBS Studios Inc. Retrieved 26 November 2018. ^ Morgan, Jennifer Wilde (February 23, 2016). Come to the Garden: A Novel. Simon and Schuster. p. 200. ISBN 9781501131332. ^ "Louis Gossett Jr". Superior Pics. Retrieved 26 November 2018. ^ "Growing Interest in DNA-Based Genetic Testing Among African American with Historic Election of President Elect Barack Obama". PRWeb. Cision. 27 November 2008. Retrieved 26 November 2018. ^ Abrams, Natalie (9 February 2010). "Louis Gossett Jr. Diagnosed with Cancer". TVGuide.com. CBS Interactive Inc. Retrieved 26 November 2018. ^ Moring, Mark (23 February 2011). "A Healing Journey". Christianity Today. Retrieved 26 November 2018. ^ "African American Short Films". TVGuide.com. ^ "Dvorak's New World". CMP South West. 3 December 2006. Archived from the original on 5 January 2009. Retrieved 26 November 2018. ^ Reel, James (30 November 2006). "Burleigh's Greatest Hits". Tucson Weekly. Retrieved 26 November 2018. 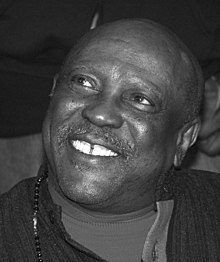 Wikimedia Commons has media related to Louis Gossett Jr..